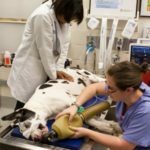 Over 100 board-certified veterinary specialists from around the world collaborated to develop the Reassessment Campaign on Veterinary Resuscitation (RECOVER) evidence-based veterinary CPR guidelines. Two of RECOVER’s leaders have designed these courses with the Cornell University College of Veterinary Medicine for veterinarians, veterinary technicians, and students to learn the core veterinary CPR skills needed to increase survival rates in animals experiencing cardiopulmonary arrest. Choose between our Basic and Advanced Life Support courses or bundle the two for additional savings. Special offers available for technicians, students, or practices with 5+ staff. These comprehensive and highly engaging courses include videos, assignments, and quizzes covering the latest in CPR techniques. These courses are peer-reviewed and offer official certificates of completion by the American College of Veterinary Emergency and Critical Care (ACVECC). They are endorsed by the Veterinary Emergency and Critical Care Society (VECCS), and teach the most current, evidence-based guidelines developed by the Reassessment Campaign on Veterinary Resuscitation (RECOVER) initiative, making them the gold standard in veterinary CPR training. Are you a veterinary nurse/technician or a student? If so, click here. CPR: Basic Life Support is the first peer-reviewed small animal CPR course that teaches the essential concepts needed to maximize outcomes in patients with cardiopulmonary arrest. When a cardiopulmonary arrest occurs in your practice, having a well-trained team ready to provide high-quality CPR may be the difference between life and death for your patient. Authored by Daniel J. Fletcher, PhD, DVM, DACVECC, Associate Professor of Emergency and Critical Care at the Cornell University College of Veterinary Medicine, this course teaches the evidence-based Basic Life Support (BLS) guidelines developed by the Reassessment Campaign on Veterinary Resuscitation (RECOVER) Initiative. It is the only BLS course endorsed by the Veterinary Emergency and Critical Care Society (VECCS), and is the only course that provides official certification in veterinary CPR through the American College of Veterinary Emergency Critical Care (ACVECC). Certification in BLS by the American College of Veterinary Emergency and Critical Care will be conferred upon completion, and a certificate suitable for display in your practice will be provided. Topics include use and interpretation of important monitoring equipment, how to diagnose the ECG arrest rhythm, and drug therapies and other advanced interventions that can improve the likelihood of saving a life. After completing both courses, you’ll have an understanding of the entire CPR algorithm. Cardiopulmonary arrest happens. This course, authored by Daniel J. Fletcher, PhD, DVM, DACVECC, Associate Professor of Emergency and Critical Care at the Cornell University College of Veterinary Medicine, will help prepare your team and maximize the chance of a successful outcome for your patients. Certification in ALS by the American College of Veterinary Emergency and Critical Care will be conferred upon completion, and a certificate suitable for display in your practice will be provided. Should you need any technical support while taking the online course, please contact us at support@recoverinitiative.org or call (516) 630-3479. Please note that these are not the same courses as those offered by eCornell and eCornell should not be contacted for support. If you have 5 or more people registering for your organization, please contact info@recoverinitiative.org to receive the volume pricing information. Students who successfully complete both courses in this certificate program receive a CPR: Basic Life Support Certificate and a CPR: Advanced Life Support Certificate from the American College of Veterinary Emergency and Critical Care (http://www.acvecc.org). CPR: Basic and Advanced Life Support are the only veterinary BLS and ALS courses endorsed by the Veterinary Emergency and Critical Care Society (http://www.veccs.org).